We're brewing beer, a pilsner. 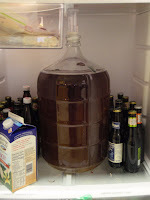 That's Karl (I gave him a good German name), our carboy, chillin' in the fridge. Surrounded by bottles and bottles of beer... hopefully inspiring Karl to make some fermentation happen. And really, we consume more than beer, though this shot of the fridge may lead you to think otherwise. We also have cheese and sauerkraut in there. And soy milk. Brewing is a fairly straightforward process, especially if you buy a kit. The basic steps are: making wort, fermentation, conditioning, and bottling. Kits usually come with liquid malt extract, which when reconstituted in water produces wort (generally means unfermented beer), hops, and yeast. As you boil the water and malt, hops are added at two different points--the first for bitterness and the second time for flavor and aroma. The hops come in the form of compressed green pellets, a far cry from the vivid green pinecone-like hop flower that you see climbing poles in the fields. Just for kicks we tried one and it was truly terrible (Disclosure: I hate hoppy beer). It took a while to get that horrible bitter taste out of my mouth! 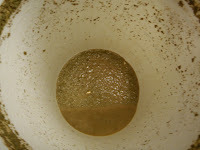 After the wort is done boiling, the hot wort is poured into the Ale Pail (the first stage in the two-stage fermentation; Karl is second) filled with cold water. The yeast is then "pitched" (aka poured into the bucket), which, according to the Carl Sagan-inspired label, releases "billions and billions" of yeast into the wort and fermentation begins! So now we wait... for Karl to make us some beer. I will attest that you and Matt have had some success with beer-making! I really liked the bottle of ??? (I can't remember the type of beer you brought over off the top of my head right now) that I tried a few weeks back. Thank you, Erika!